What every PMP need to know about the Dec 2015 changes in PDU requirements? PMI has implemented a major change in the CCR program (i.e. 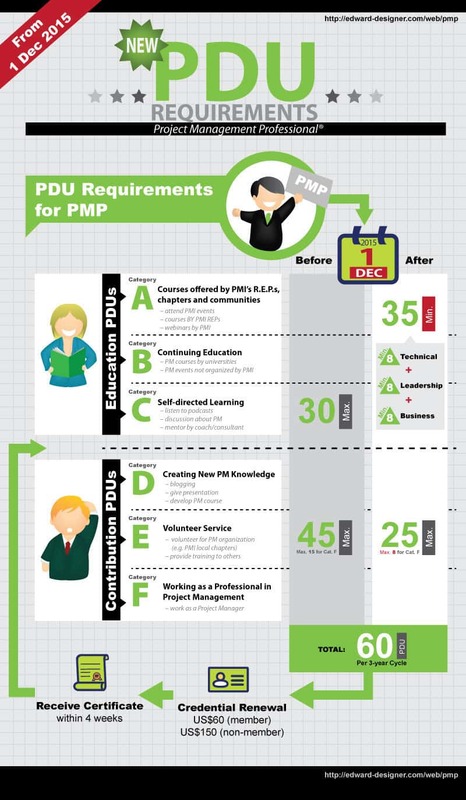 PDU requirements) for PMI Certifications (from 1 December 2015). This post aims to highlight the changes that every Certification holders and aspirants would need to know. 1 Summary: How to Get PDU in the Correct Talent Triangle Skills Area for FREE? 4 How the Changes in PDU Requirements Affect PMP® Certification Holder? 5 How the Changes in PDU Requirements Affect Current PMP®? 6 Why PMI made the Changes in PDU Requirements? Summary: How to Get PDU in the Correct Talent Triangle Skills Area for FREE? With the implementation of the Talent Triangle requirement for PMP® and PMI-ACP® holders, it is more difficult for Certification holders to earn PDUs in the correct skills area as most of the PDUs earned through reading books, watching webinars or attending lectures cannot be clearly categorized according to the Talent Triangle. Luckily, there is a way to earn all the PDUs for FREE that are readily accepted by PMI without questions (there is no need for you to submit the PDUs by yourself!) after watching the live/recorded webinars. You just need to be a PMI member. There is no PDUs limit for the different means of getting the required PDUs — you can earn all of your education PDUs through online courses, self-study or conferences BUT you will need to provide evidences of engaging in those education PDU activities upon PMI audit (e.g. you will need to provide the certificates and/or course outlines for online courses organised by online learning institutes). 2The maximum PDU gained through “giving back to the profession category” (i.e. previously Category D, E and F) will be reduced to 25 (was 45 before). How the Changes in PDU Requirements Affect PMP® Certification Holder? How the Changes in PDU Requirements Affect Current PMP®? For current PMP® Certification holders, you will need to claim educational PDU (Category A,B and C) based on the new “PMI Talent Triangle” system beginning 1 December 2015. For holders of PMP® Certification that expire before 1 December 2017, all PMP® PDU claimed will be honored (i.e. if you have already reached the 60 PDU requirements, you will be able to renew your PMP® Certification without problems and there is no need to obey the new maximum / minimum limits at the time being). For holders of PMP® Certification that expire on or after 1 December 2017, all your PMP® PDU claims will need to be assessed based on the new PDU requirements (i.e. obey the maximum / minimum limits of different PDU Categories) even though you have earned the PDU before 1 December 2015. This means that all current PMP® aspirants will be affected by the change in PDU requirements. The cost for PMP® Certification renewal remains the same (i.e. US$60 for PMI members). Why PMI made the Changes in PDU Requirements? PMI does not mean to make the collection of PMP® PDU more difficult. PMI made the changes in order to ensure relevance of PDU scheme to the current business world and to enhance the competitive advantages of PMP® Certification holders. PMI has done extensive market research to understand what employers are looking for in project practitioners. The three identified skills areas are represented as the PMI Talent Triangle of Technical Project Management, Leadership and Strategic and Business Management. More details on the changes of PDU requirements can be found at PMI website. 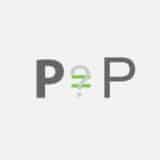 Hi Edward, thanks for your information, I have just renewed my PDUs successfully! A quick question, since I have just renewed and I found that the next cycle (i.e. 2021 to 2024) has begun right away. Would any contributions to the PDU earning be counted from now to say like 2020? Do I have to wait until 2021 to start earning? Thanks a lot. Thanks! Better wait until 2020/2021 to begin collecting you PDUs as only the PDUs earned in 2020 can carry forward to the next re-certification cycle. Once we have attained the 60 points for the current certification, any additional PDUs we get can be carried forward to the next year (up to 20). How do we determine how many PDUs of each skill area (ie Technical, Business or Leadership) is carried forward. Ideally, I would like to carry forward 6,7,7 PDUs over. How is that determined? A great question but as PMI does not mention this nor have I experienced this personally… sorry cannot help you out. Thanks for the reply, Edward. I googled and came across this page, which may throw some light on the query. I understand it as: if we were to align the additional points into the 3 skills areas that we determine, they will flow over in accordingly to the following year. Congrats in your page! I thinks it is of great value! Question: Do you know if I obtain my certification on June 2017 and got all necessitated PDUs in July 2017, these PDUs would be valid for the renewal? At the end, would it save you money to be a PMI member for the re-certification? You bet! 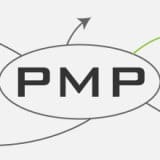 Once you have passed the PMP Exam, you can begin collecting PDUs. Suppose you are still an active member of PMI, you can get all the required PDUs for free by watching webinars in as short as a week. 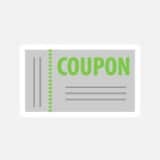 This is the cheapest way to renew your PMP credential. However, this is not recommended from the point of continuing education and advancement of your project management knowledge. Thanks for pointing out that. I have since gone through the PMI CCR Certification Requirements Handbook twice and found that you are RIGHT. The limit for the kind of PDU education activities has been lifted. There is NO categories A, B or C any more. You can earn all the PDUs through e.g. self-directed learning. Thanks again for making things clear! My PMP certification expires before 1st Dec, 2017. Can I earn all my PDUs under the ‘Education’ category? Besides, I am a frequent visitor of this site. Keep up the good work. If Yes, do I need to earn the PDUs by the respective Education Categories (Technical, Leadership and Strategic Business Management Skills)? Thanks big time. Yes and Yes, if you are a PMI paying member, you will be able to earn all your PDUs from projectmanagement.com for FREE by viewing recorded/live webinars. The webinars will indicate which categor(ies) the PDUs will fall into which is extremely convenient as the PDUs by projectmanagement.com are pre-approved by PMI! Some sections of your site really helped me pass my PMP exam earlier this month – thank you. Especially the practice exam links and formula calculations. Coupled with Rita’s book and a few passes of the official syllabus, that was all I needed. -Seems like a cost effective way ($99) to earn all the PDU’s and hit all the PMI talent triangle. However login only lasts for 60 days. -Slightly more expensive ($150) but huge resource bank and lasts for 1 year and hits all PMI talent triangle. -Quite a lot more expensive ($720 over 3 years on $20 monthly subscription), but looks like one of the more manageable ways to earn your PDU’s over a 3 year period. However the big downside is that just this cours, only gets you 3.25 points in the Business & Strategic triangle section, and you would need to get the rest elsewhere. Let me know if I have missed any other good (all in one place) resources to attain my 60 PDU’s which are aligned to the PMI talent triangle. I earned all my PDUs this way. Thanks! And as it links directly/automatically updates my PMI/CCRS profile, this seems to be the best way to gather PDU’s. Being, well….almost free, is a bonus. Yes, that’s a nice bonus for the PMI membership! Is it possible to earn all my PDU’s from my Masters in Project Management, even though my PMP Cert expires in 2018? How do you account for Category 1 (Technical Project Management, Leadership, and Strategic and Business Management) with only college courses? Yes, project management courses organised by Universities are classified as Category B. You will have to identify how many PDUs are about Technical Project Management, Leadership, and Strategic and Business Management based on the course syllabus of the courses. You’re awesome, thank you so much. Dear Edward, thank you so much for this. So helpful. Do you have idea if books in leadership (by the likes of John Maxwell) can earn PDU? You should be able to earn PDU by reading leadership books (but it all depends on what PMI thinks). It doesn’t hurt to submit your PDU claim and wait and see what PMI will approve you. Do let me know your results which will be useful for fellow PMPs. Can your 60 PDU’s all be the education area? As long as it meets the technical, leadership, and strategic category requirements? Thank you. Sure! I got all my 60 PDU for my latest PMP re-certification in the education area. first of all congrats for your magnificent page , I used it a lot when I obtained the PMP back in Feb2015 ( almost 1 year ago ) . During the last 12 months I have reported several PDUS that have being converted after 12/01/15 in General Education but with no Talent Triangle assigned . How are they going to be assessed in the new categories ? Do I have to delete them and re-apply for them ? I have 2 options in the PMI WEB , one is to “retract and edit” and the other is to “delete” I am afraid to use any of both. I’ve just passed my ITIL Foudation (Sylllabus 2011) Exam. 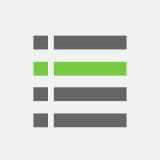 I’m a PMP holder and i want to claim PMP PDU. You previously wrote a paper on claiming PMP PDU With ITIL exam on the page http://edward-designer.com/web/claim-pmp-pdu-itil-v3-foundation/. Unfortunately, with PDU new sheme, it’s no more possible to claim these PDU using the approach describes on the page. 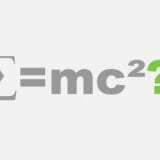 Can you give me more information on how i can solve this matter. You can still claim the study hours for your ITIL Foundation Exam in the new PDU scheme. It depends on whether you self-study or attend a course. The PDUs would fall in the Category A, B or C. And the PDUs to be claimed should be in the “Leadership” and “Strategic” domains. I’m bit confused with this new PDU sheme. 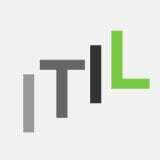 I’ve just got my ITIL Foundation Certification. I’m a PMP holder and i would to know how i can claim PMP PDU With ITIL. In the new PDU scheme, I believe you can claim your ITIL study as either “Course or Training”. And the PDUs to be claimed should be in the “Leadership” and “Strategic” domains. Remember, it is the study hours that counts (not the ITIL Foundation Certificate). Thanks for quick reply. Still have few clarifications . The role for Project Manager will earn you a maximum of 8 PDU for the 3-year cycle. Hence, you will need an extra of 16 PDU from Category A/B/C in the Leadership and Business disciplines (minimum 8 for each). The new requirement for Technical/Leadership/Business PDU begins from 1 Dec 2015. 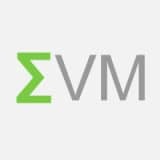 For the PDU, Six Sigma training would be counted as Category B (unless it is provided by PMI R.E.P. which will be counted as Category A) and as Technical PDU. Sorry that the training completed prior to getting PMP will not be eligible for claiming PDU. Thanks a lot Edward for your valuable inputs on PMP Re-certification. It will help if we get to know how to earn the Technical,Leadership and Business education points. e.g. If I acquire a Java certification, then will it count as “Technical” education? I could not quite understand this from PMI site. In case you can provide pointers on how to earn the points under “Technical,Leadership and Business” triangle, it will really help. Thanks for your comment. If you earn the PDU from a PMI R.E.P., then you will be provided with the necessary information on the classification of the PDU according to PMI Talent Triangle. For others, you will have to estimate it yourself and PMI will have the final say on the classification / whether to approve your claim. As for Java certification, I am afraid only the part on project management (if any) is counted towards the PDU in Technical Project Management. Remember, PMP is about project management, pure technical knowledge in Java is not considered valid to claim PDU. PS – Please let your readers know that although the PDU changes are a bit confusing now, they will actually force us to broaden our skillsets and become more valuable to our stakeholders. I like the idea of getting credit for things that aren’t in PMBOK! Thanks a lot for your compliments. I echo you and will surely convey your view on the upcoming PDU changes. Thanks! very usefull and a very nice Infographic. May i ask if you using a tool and if so which one? A lot of respect for your work and your great website! I made use of Adobe Illustrator to make the infographic. Thanks for your encouragement! I have a small question, i attended PMP training for 35 PDU’s in November 2014, would these PDU’s be valid if i want to take exam after new pattern has been launched in December 2015..
Sure! The 35 contact hours gained will valid for life, you can apply for the PMP Exam anytime using your 35 contact hours. Its seems a bit more confusing than before with the 3 categories broken out. Also, working as a practitioner from 15 down to 8 seems a bit harsh considering that is where we spend most of our time working as a project manager. Some project managers may not be interested in the very “technical’ aspect of projects but more of the overall ideas or processes involved and leave the specific technical details to those resources most knowledgeable. Not a big fan of the changes. This is a really useful summary and your graphic for the PDU cycle really makes the changes clear. Thanks for such a great website. I visit your site often while studying for PMP and came back to it recently when looking into the changes to the PDUs. I deliver project management training as instructor. Which category can I get PDU? I was getting 10 PDU for each training before. I believe you can still claim PDU in Category D or E (if the teaching is on a voluntary basis) as before. But there is a maximum of 25 PDUs for the 3 year re-certification cycle now.